According to research published by Zillow, the national average cost of homeownership, in addition to mortgage payments, amounts to roughly $9,400 per year, or about $780 per month. While homeownership can be an expensive undertaking, costs in the Baltimore Metro region seem reasonable relative to similar cities across the country. 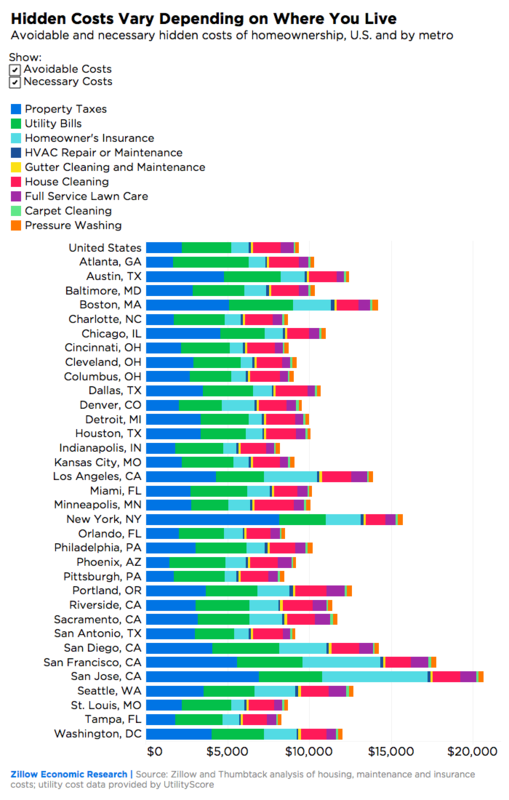 Zillow defines unanticipated costs as property taxes, utility bills, homeowners insurance, HVAC repair or maintenance, gutter cleaning, house cleaning, lawn care, carpet cleaning, and pressure washing. Not included are homeowner association fees, which are becoming mainstream with the new supply of townhomes and condos in central Maryland. According to Zillow, the average hidden cost for Baltimore-area homeowners is $10,339, on par with Philadelphia ($10,205), Miami ($10,173), Minneapolis ($10,102), and Dallas ($10,712). The Baltimore market appears to be a relatively good value when compared to other coastal cities with strong economies, such as San Jose ($20,655), New York ($15,721), Boston ($14,221), and nearby Washington D.C. ($12,024). More expensive cities tend to have higher property taxes and homeowners insurance premiums because they are linked to higher property values. Baltimore Metro has a lower-than-average property tax ($2,901) compared to other metros on the list (below), with only a handful of cities logging lower tax bills. Notably, of the 34 metros in this study, only one coastal city — Tampa — beat Baltimore with lower property taxes. So, if you’re looking for coastal property with a low taxes and monthly expenses, Baltimore is a strong contender! Overall, Baltimore Metro has relatively affordable property taxes and home maintenance expenses compared to the other U.S. cities, positioning itself as a viable place for long term investment. It has the lowest property tax in the Northeast corridor, making it attractive for families, professionals, and retirees alike to move south to a milder climate with an affordable cost of living, accessible job market, and a leisurely way of life on or near the Chesapeake.